Buick has done well in creating a comfort and spacious three-row SUV with the Buick Enclave. 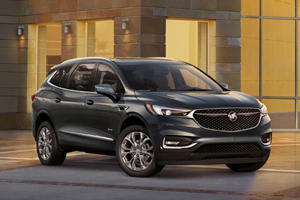 Better still, the Buick Enclave is also rather refined and is quite reasonably priced in comparison with its main rivals. That said, some of that money you’ll save will go towards filling the Buick Enclave’s gasoline tank on a relatively regular basis, and the power is also a bit lacking. 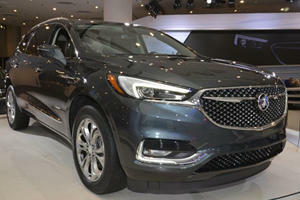 Still, as an overall package, the Buick Enclave does have plenty of appeal. The interior is also made from high quality materials. The Buick Enclave’s interior is spacious from the front seats all the way back to the third row, and in total equals seven seats. That can go to eight if the benched middle row is specified. The interior is also made from high quality materials, and becomes even more upmarket with the optional leather upholstery. The front seats are power operated and the middle row can slide forward or backward. The dashboard has a busy center console with lots of buttons and dials , as well as a large touch screen. The Buick Enclave gives the most space across the board among some of its more expensive competitors. The trunk space is massive at 23 cubic-feet, and with both the middle and back row seats folded down comes to a whopping 115 cubic-feet. Just the back row down alone frees a total of 69 cubic-feet, plenty for a family of four to pack in a collection of soccer balls, golf bags, snowboards, skis and the like. All this the Buick Enclave makes possible while still providing optimal comfort. The Buick Enclave gives the most space across the board among some of its more expensive competitors equipped with similar features, namely the Infinity QX60 and the Acura MDX. The Buick Enclave’s size also means the SUV isn’t very maneuverable in tighter spaces. When fully loaded, the Buick Enclave struggles to build up speed. The Buick Enclave’s size also means the SUV isn’t very maneuverable in tighter spaces. That said, the Buick Enclave’s does have responsive steering that’s light at city speeds, but has more weight when you’re driving at highway speeds. Make no mistake though, the Buick Enclave is a comfortable albeit fairly sluggish vehicle. Against cars like the Acura MDX, the Buick Enclave’s driving performance suffers. The Buick Enclave is front-wheel drive as standard, but can be fitted with all-wheel drive. The Acura MDX is also easier to navigate tighter spots with, and also is able to build speed at a faster rate than the Buick Enclave. The Buick Enclave is front-wheel drive as standard, but can be fitted with all-wheel drive. While it is costly, the all-wheel drive system is worth considering if you’ll regularly need the traction benefits. Visibility Is another thing that suffers on the Buick Enclave, but it comes standard with a rear-view camera and a rear parking assist. Just the one engine/transmission combo to choose from. A 3.6-liter six-cylinder gasoline engine that produces 288-hp and 270 lb-ft of torque. The Buick Enclave is only available with one engine: a 3.6-liter six-cylinder gasoline engine that produces 288-hp and 270 lb-ft of torque, which is in between the Infinity QX60 at 265-hp, and the Acura MDX at 290-hp. The Buick Enclave’s fuel efficiency isn’t as good, though. With claims of a dismal 15mpg in the city and 22mpg on the highway, the Buick Enclave is well short of what the Acura MDX can return (19mpg city/27mpg highway) gears. The Buick Enclave is also only available with a six-speed automatic transmission. The Buick Enclave is also only available with a six-speed automatic transmission, which makes smooth and quick work of gear changes. With a towing capacity of 2,000 pounds the six-cylinder engine should be enough for the needs of most buyers. The Buick Enclave received an overall five-star rating from the NHTSA. Where the Buick Enclave starts to claw back some lost ground is in the safety aspects. Standard in the cheapest model, which starts at around $35,000 the Buick Enclave has lots of safety features, including traction and stability control. The Buick Enclave received an overall five-star rating from the NHTSA. The Buick Enclave has only received two recalls since going on sale in 2008.The Buick Enclave is alsp on par with the competition, offering a four-years/50,000-miles bumper-to-bumper warranty and a 70,000-miles warranty for the powertrain. Buick Enclave at its base price comes out cheaper than both the Infiniti QX60, which starts at around $42,000 and the Acura MDX at around $43,000. 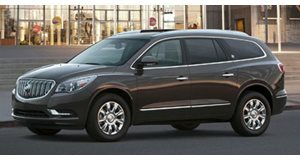 We recommend the very base Buick Enclave model equipped with the Convenience package at around $39,000. The Buick Enclave comes packed with so many features, that the only thing really worth adding on is the all-wheel drive option, which is not absolutely essential. As a car that was built for comfort and minimal road noise and with the snow season only a few months out of the year, it’s difficult to justify purchasing the all-wheel drive option for an extra $6-7,000. Buick Enclave at its base price comes out cheaper than both the Infiniti QX60, which starts at around $42,000 and the Acura MDX at around $43,000. All three cars handle somewhat similarly, have the same kind of power delivery, offer similar warranties and horsepower ratings and all three are comfortable enough. The decision on which one to buy essentially comes down to the price. Overall, we like the Buick Enclave. It might be big and get horrendous gas mileage, even for a mid-sized SUV, and it might not have the most powerful engine around. It doesn’t handle all that well, and it suffers a bit from a visibility handicap. 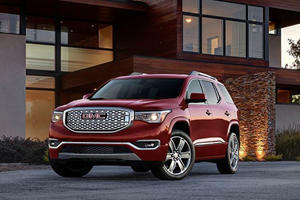 However, it does what’s expected of a mid-sized SUV, and does it well. The car is comfortable, it’s nice, and while the price tag is lower than its competition it doesn’t feel any cheaper. Buick Avenir models will have a smaller premium than GMC Denali models. These are the most "American" cars on sale today.